My daughter and I are so excited to share the new Nerf Rebelle line with you! Having 5 brothers, her nerf toys up till this point have been very 'boy' oriented! Sure they look cool for boys, but what about the Girls who need to sneak up on their brothers and take over their fort? Or when the brother is intruding on her space! 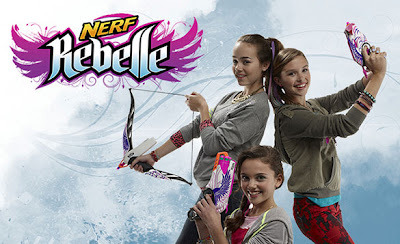 The new line of Nerf Rebelle hit the stores on Sept 1st, and now your daughters can have their own special Nerf toys! We got to try the Heartbreaker Bow and additional darts. Nerf continues to make wonderful toys for the kids to play without getting hurt. Imitating their favorite shows and movies by taking each other out, boosts the imagination and gives them a much needed break from the throws of life. The bullets are gorgeous! No mistaking which ones are hers versus her brothers! The dart refill pack is handy to make sure she has plenty of bullets for her quest. The Heartbreaker Bow can be used in or outside. The nerf bullets are very soft and won't break items in the home. These are brightly colored to easily find when they are shot outside at targets as well. The Heartbreaker Bow works like a real bow, but blasts darts up to 75 feet! Pull back on the string and release to fire the blaster. Your daughter can even stow up to 5 darts on the bow for easy reloading." Experience the Rebelle Blasters online with free games to test your skills! Be sure to check out Nerf Nation on Facebook!